Massive news for The Curse of Oak Island fans — a huge dig is currently under way at the Money Pit, prompting speculation that we could be on the verge of a historic find. An enormous convoy of trucks carrying heavy machinery including a 300-ton crane have been arriving en masse at the island off Nova Scotia over the past few days. Camera crews have been seen filming the machinery arriving over the island’s causeway using a camera-equipped drone. As well as the crane, other equipment making its way on to Oak Island included rollers, excavators, bulldozers and air compressors. A truck-load of large metal pipes were also driven in, and a huge mobile drill set up at the Money Pit. 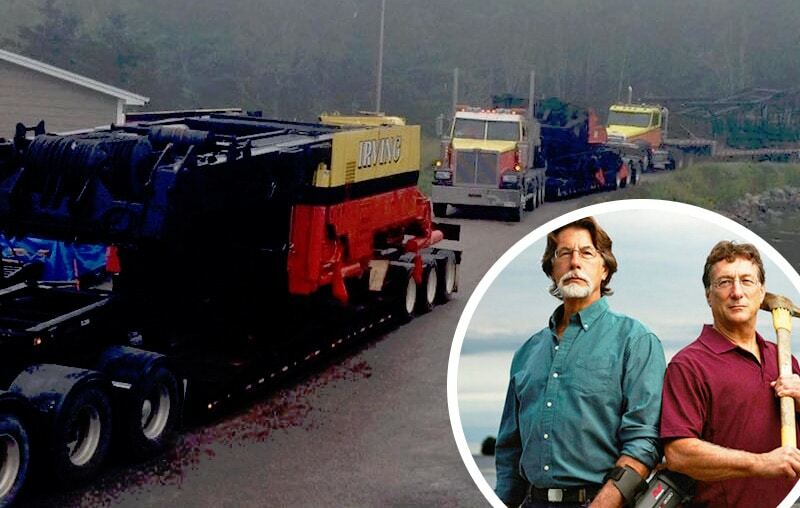 Deliveries of equipment began early last week, with the “big guns” — including the 300-ton crane and its various components — arriving yesterday, according to Karen Publicover, who owns property across the causeway from Oak Island. She said a well drilling firm had arrived first earlier in the year with drilling continuing all summer. She said rumours are that several holes have been drilled in a grid pattern around the Money Pit area. The drilling equipment was then taken away before more heavy equipment was brought in, starting with huge lighting rigs which are used when teams are working on the site at night. Karen — who has lived across the causeway for more than 18 years — has been keeping fans updated about the equipment’s arrival in posts on her Oak Island From The Other Side Of The Causeway blog and Facebook page, which you can follow for the latest updates. She had previously told how some filming also took place earlier in the summer with camera crews shooting scenes around her home and across the causeway. No official announcement has yet been made by History as to whether or when they will be airing Season 5 of The Curse of Oak Island, but we told earlier this month how there have been several things pointing to the series going ahead.